BioBlue™ (Cat No. 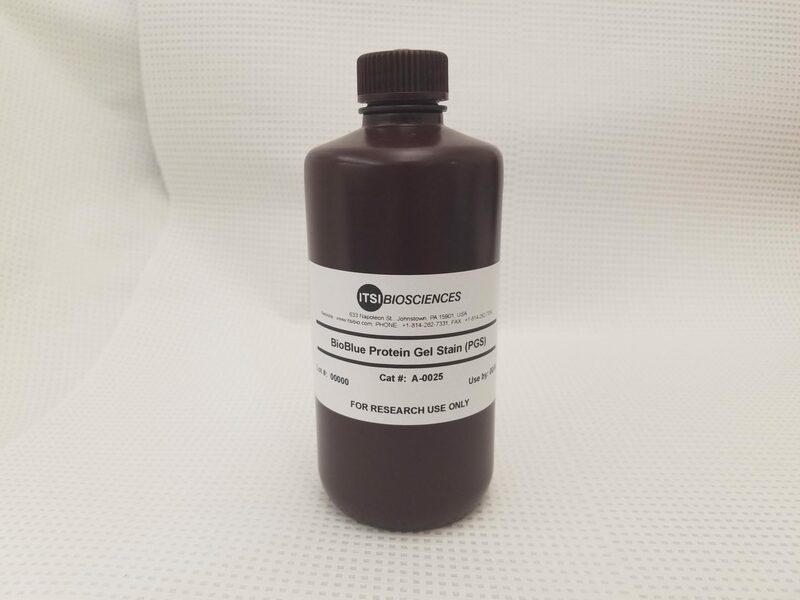 A-0025) is a modified colloidal Coomassie G-250 based protein gel stain specifically formulated for consistent and reproducible visualization of total proteins after polyacrylamide gel electrophoresis. BioBlue™ preferentially binds to proteins forming dark blue and distinct protein bands (Fig 1). 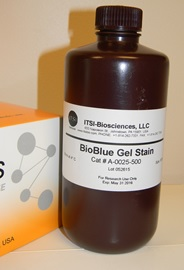 BioBlue™ is sensitive and reveals many more low-abundant protein bands compared to competing Coomassie R-250 and G-250 based stains because of the decreased staining of the gel. The stained proteins can be easily visualized and picked/cut from the gel without the methanol or acetic acid destaining step, making the product easy/fast-to-use and environmentally friendly. BioBlue™ is fully compatible with mass spectrometry and western analysis. Fig 1: Heart tissue sample separated by SDS-PAGE and stained with BioBlue. With BioBlue the background is very low which means that the protein bands will be more readily visible.